Trinley Nyingpo, the “essence of enlightened activity,” is the concise Guru Rinpoche sadhana practice from the Tug Drub Bar Chay Kun Sel treasure cycle discovered by the King of Treasure Revealers, Chog Gyur Dechen Lingpa, along with Jamyang Khyentse Wangpo. It is an important component of the Rinchen Terdzod (treasury of most precious dharma treasures) compiled by Jamgon Kongtrul Lodro Thaye. 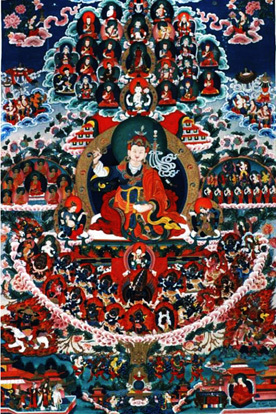 The mandala for this sadhana includes the Dharmakaya Buddha Amitayus, the Samboghakaya Buddha Avalokitesvara, and the Nirmanakaya Buddha Padmasambhava, Nangsid Zilnon Pema Tod Teng Tsal, the “Skull-Garlanded Hero Who Overwhelms the Phenomenal World.” It also includes twelve additional manifestations of Guru Rinpoche. Click here for information on nearby hotels.